I received product to review through partnership with Alurent. All opinions included in this review are my own. What age were you when you started to see fine lines and wrinkles? Would you like to see those fine lines and wrinkles instantly diminished? This new product is like an erasure for your wrinkles, a “photo-shop” quick application process that you can do at home. Sounds too good to be true? It comes with a 14 day money back guarantee. Alurent Anti-Aging + Instant Erasure Serum is a patented, new skin care product that tightens skin to visibly lift as it smooths out creases and wrinkles. The best part, it works in 90 seconds! The combination of carefully chosen certified organic and natural ingredients will not only have an instant effect but when applied daily will help the skin regain a radiant and younger appearance over time. That is what most of us are looking for right? Not to try and turn back the clock and spend thousands of dollars in the process, just a younger, more youthful version of ourselves! Alurent Anti-Aging + Instant Erasure Serum will re-hydrate your skin right away, and then you can simply apply your makeup over the serum. I asked my lovely blog partner Racquel to give Alurent a try and then take photos right away. Her photos were taken after just 90 seconds and she said that you can actually feel the product working and tightening the skin. Racquel is a busy Mom of five who is healthy and looks great. Like many of us, she does not have the time or the extra resources to get expensive treatments outside the home, plus she is not a big fan of pain! She also finds it challenging and time consuming to sort through all the clutter that we see in the department stores and beauty aisles. Here are closeups of the under eye area with no retouching. You can see a noticeable improvement to the under-eye area in Racquel’s after photo.I don’t know about you, but if the under-eye area looks wrinkled and saggy, it is very hard to try and cover this with makeup alone. Often you end up drawing more attention to the area! Directions: Make sure skin is clean and dry. Apply a small amount to fingertip massage thoroughly over affected area. Keep area still for 2 to 3 minutes allowing product to dry. If application leaves white residue, apply a small amount of water or moisturizer to make residue disappear. Makeup or foundation may be applied over the Alurent Anti-Aging + Instant Erasure Serum. Of course, I have a promo code! Alurent would like to share a special online shopping discount with my readers for new Alurent Anti-Aging + Instant Erasure Serum. For a limited time, by entering the code SHOP50 at checkout, you can purchase the new serum at a discounted price of $50 plus get Free Shipping (it’s normally $79.95). Plus it comes with a risk free 14-day money back guarantee. 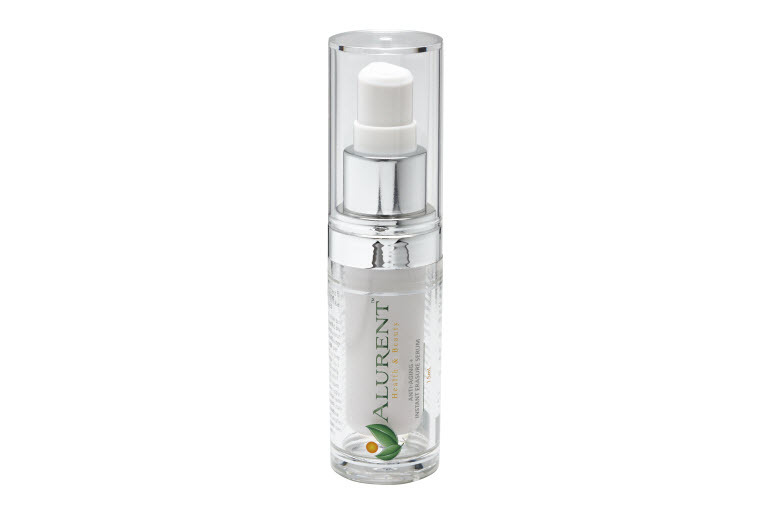 You can give the a try at this link http://www.alurent.com/alurent-anti-aging-instant-erasure-serum.html and don’t forget to apply your special promo code SHOP50 at checkout.